Hello everyone! So glad you are hopping with us today for the release of the newest Trendy Twine, Bumblebee! Today only you can purchase this fabulous twine for $8.00 (goes back to $9 on Friday). If you have just come from the fabulous Kate, you are on track. But if you just stopped by my blog, be sure to head over to Twine It Up! with Trendy Twine so you don't miss a thing :) Plus, we have two new Design Team members that started today. Be sure to leave some welcome love on Brigit's and Candace's blogs--we are so happy to have such talented ladies on the team! Now, you know there is a fun prize for one lucky person. 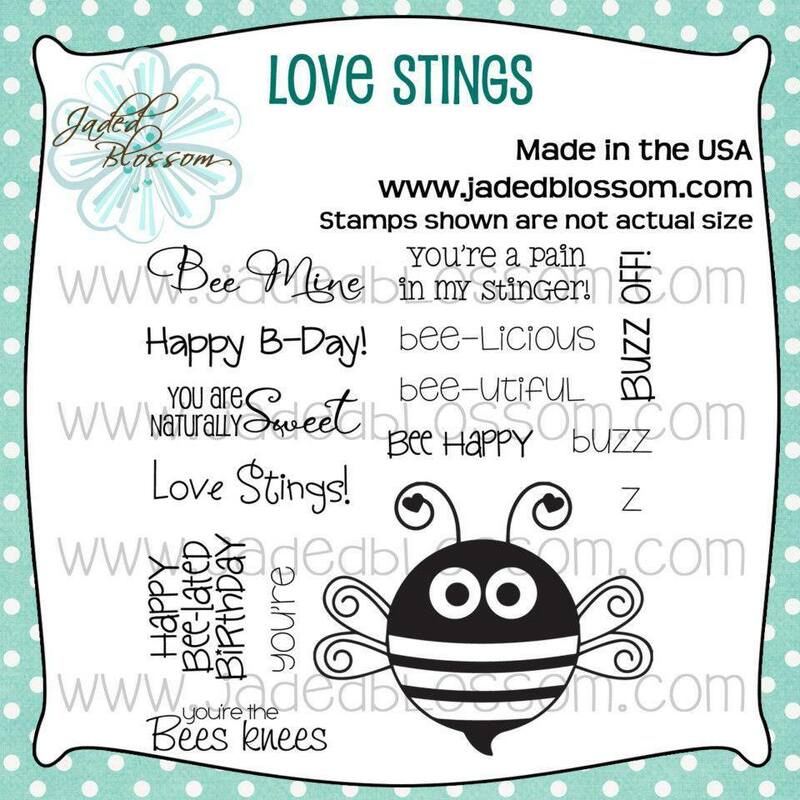 Be sure to comment on all the blogs in the hop for your chance to win Love Stings from Jaded Blossom. 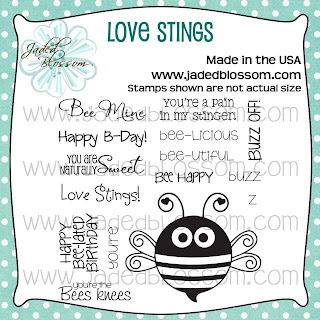 It goes along so well with our bee theme today :) You have until 11:59pm CT Friday the 5th to leave your comments. Thanks so much for hopping with us today. 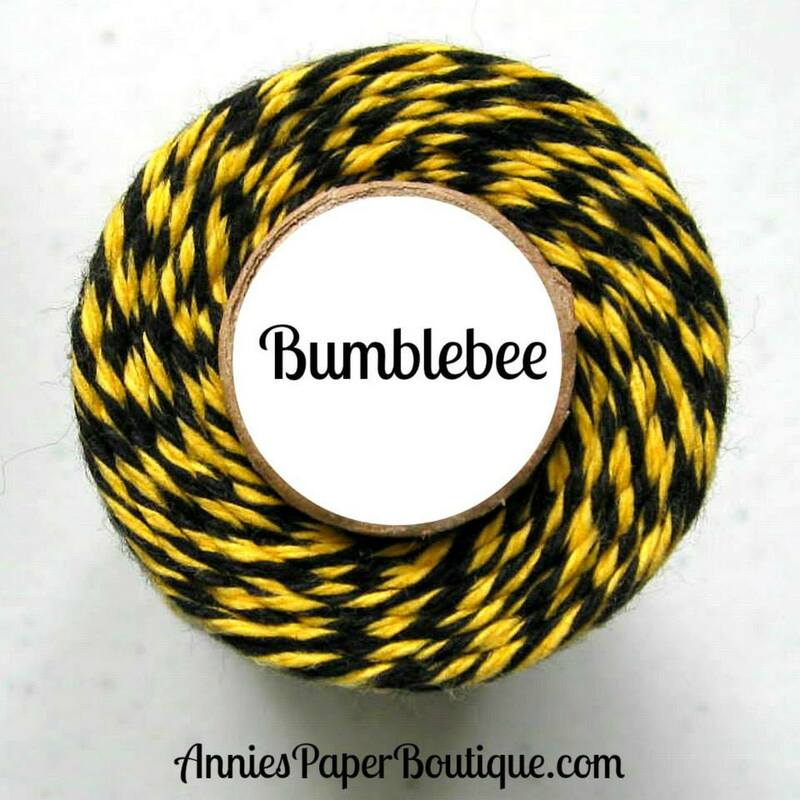 Be sure to get your entries in, buy your Bumblebee Trendy Twine while it's on sale today, and stop back often to see all the fun things you can do with Trendy Twine! This is super adorable Helen!! Love the twine buttons and the bee...well he is just too cute!! Thanks for sharing and have a GREAT 4th of July! Thanks for the tip on how to make the little buttons. Adorable card! oh my, the little antenna... the little bow... cute cute cute! Awesome project. The use of twine is genius! I need to be more creative with my twine! You are inspiring me. Adorable, Helen. This little bee is too cute and I love how you added twine to the antennas, too. Love your card!Super Cute Card!!! Cute, cute, cute. Love the twine as buttons. Oh Helen, your card is too stinking cute! Love the antennas! So super adorable Helen, love how you used the twine in the corners!! Adorable!! love that bee. The circles of twine are just perfect!!! Love it!! Very cute card and love how you used the twine. Great card Helen - love the little twine circles! Too Darn cute! I love the little swirls on his antennas. CUTE! Adorable, your bee is super cute. I love your buttons and the stitching you added around the bees wings! I'm a new follower. How adorable!! Very cute accents with your twine!! I love this!!!! So cute!! How cute is this? Just love the twine details in teh corners - would be perfect for any card! What an adorable creation all,togather! Love it, thanks for sharing!!!!! The bee is so cute with the twine on the antenna ends. Love how you embellished your card with the twine buttons on the corners! 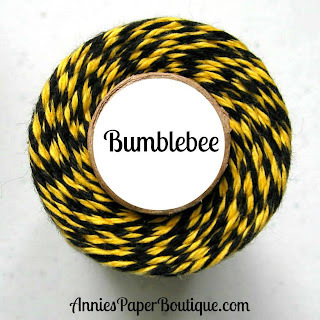 Super cute use of the twine and that bee is Cute! 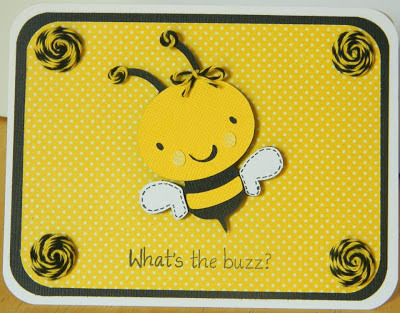 Such a cute card and the bee is adorable. This is tooooo cute! One of my favorite cuts! Your bee is adorable. Thanks for sharing. Aw! I like this! Very cute! Happy 4th. So, so sweet! Love your darling little bee and those little twine buttons are wonderful! I will have to give that a try - too cute! I love how you added the twine to his antennae and the corners. Cute card. TFS. love your card, that bee is so cute! What a cute little bee. Thanks for the instructions on how to make these buttons. I will be trying this technique. Very cute card. love how you used the twine. That is the cutest card!!! As usual, Helen, great job!! !